Former astronaut Charles F. Bolden Jr. will meet with President Obama in the Oval Office on Monday morning and likely will be appointed the new NASA administrator, a senior administration official told NBC News on Thursday. If he is chosen as expected, Bolden, a veteran of four spaceflights with more than 680 hours in Earth orbit, would be the first African-American appointed to NASA’s top post. Bolden retired from the Marine Corps in 2003 as a major general. Bolden was born in segregation in South Carolina but his grades earned him an appointment to the U.S. Naval Academy at Annapolis. There, Bolden was elected president of his class before earning his Naval Aviator wings and becoming one of America’s outstanding fighter and test pilots as well as an astronaut. PERSONAL DATA: Born August 19, 1946, in Columbia, South Carolina. Married to the former Alexis (Jackie) Walker of Columbia, South Carolina. They have two children. He enjoys racquetball, running and soccer His mother, Mrs. Ethel M. Bolden, resides in Columbia. ORGANIZATIONS: Member of the Montford Point Marine Association, the United States Naval Institute, and Omega Psi Phi Fraternity. Lifetime member of the Naval Academy Alumni Association, the University of Southern California General Alumni Association. EXPERIENCE: Bolden accepted a commission as a second lieutenant in the U.S. Marine Corps following graduation from the United States Naval Academy in 1968. He underwent flight training at Pensacola, Florida, Meridian, Mississippi, and Kingsville, Texas, before being designated a naval aviator in May 1970. He flew more than 100 sorties into North and South Vietnam, Laos, and Cambodia, in the A-6A Intruder while assigned to VMA(AW)-533 at Nam Phong, Thailand, June 1972 to June 1973. Upon returning to the United States, Bolden began a two-year tour as a Marine Corps selection officer and recruiting officer in Los Angeles, California, followed by three years in various assignments at the Marine Corps Air Station El Toro, California. In June 1979, he graduated from the U.S. Naval Test Pilot School at Patuxent River, Maryland, and was assigned to the Naval Air Test Center’s Systems Engineering and Strike Aircraft Test Directorates. While there, he served as an ordnance test pilot and flew numerous test projects in the A-6E, EA-6B, and A-7C/E airplanes. He has logged more than 6,000 hours flying time. NASA EXPERIENCE: Selected by NASA in May 1980, Bolden became an astronaut in August 1981. His technical assignments included: Astronaut Office Safety Officer; Technical Assistant to the Director of Flight Crew Operations; Special Assistant to the Director of the Johnson Space Center; Astronaut Office Liaison to the Safety, Reliability and Quality Assurance Directorates of the Marshall Space Flight Center and the Kennedy Space Center; Chief of the Safety Division at JSC; Lead Astronaut for Vehicle Test and Checkout at the Kennedy Space Center; and Assistant Deputy Administrator, NASA Headquarters. A veteran of four space flights, he has logged over 680 hours in space. 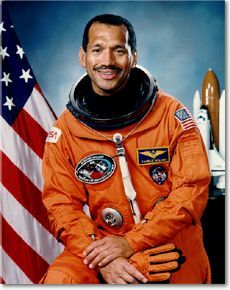 Bolden served as pilot on STS-61C (January 12-18, 1986) and STS-31 (April 24-29, 1990), and was the mission commander on STS-45 (March 24-April 2, 1992), and STS-60 (Feb. 3-11, 1994). Bolden left NASA and returned to active duty in the U.S. Marine Corps as the Deputy Commandant of Midshipmen at the Naval Academy, Annapolis, Maryland, effective June 27, 1994. Brig. General Bolden is the Assistant Wing Commander, HQ 3rd MAW Miramar, San Diego, California. On STS-45 Bolden commanded a crew of seven aboard Space Shuttle Atlantis. Launched on March 24 from the Kennedy Space Center in Florida, STS-45 was the first Spacelab mission dedicated to NASA’s Mission to Planet Earth. During the nine-day mission, the crew operated the twelve experiments that constituted the ATLAS-1 (Atmospheric Laboratory for Applications and Science) cargo. ATLAS-1 obtained a vast array of detailed measurements of atmospheric chemical and physical properties, which contribute significantly to improving our understanding of our climate and atmosphere. In addition, this was the first time an artificial beam of electrons was used to stimulate a man-made auroral discharge. Following 143 orbits of Earth, STS-45 Atlantis landed at the Kennedy Space Center, Florida, on April 2, 1992. More Billionauts on the International Space Station? I hope this news proves true! He would be an excellent choice….let’s hope that a new Administrator is named soon. Charlie Bolden is the Best Choice for NASA Administrator and many at KSC want him to fill that job as soon as possible !!! It would definitely be an honour to bestow this position to someone that is so deserving. My prayers are for you my brother. Now maybe the new Administrator can begin using CFR-1275; Investigation of Research Misconduct, filed by NASA in the federal register during the Bush administration. Since Griffin had very little incentive to use the law we can start with a new slate and move forward.